A typical workshop starts with a practical session to experimenting mark-making and other colour application techniques I use in conjunction with my found surfaces. 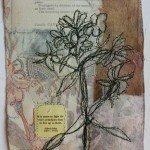 This is followed by an exploration of methods used to join pieces together with adhesive mediums and stitch. As we progress participants will incorporate their own ideas as well as creating sketches, samples and notes for further reference. Participantsts will leave the course with a sound basis of processes and working samplers, or foundation pieces which they can continue to build on and develop at home. Click here for full details of Cas’s weekend workshop. 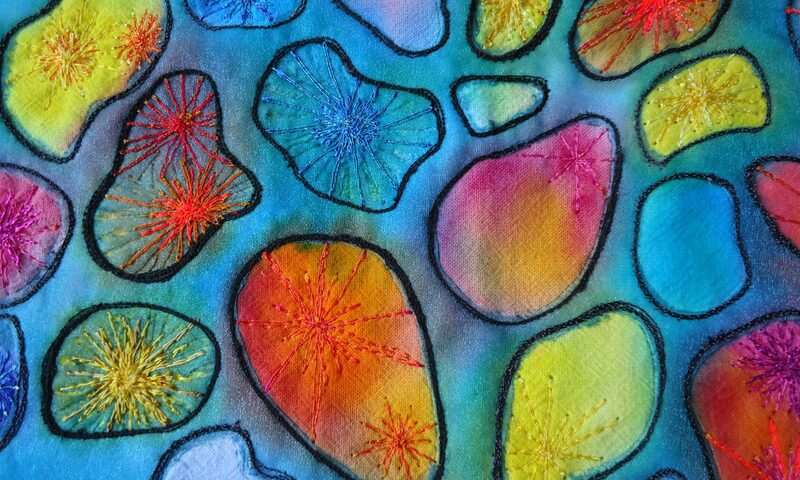 Marna Lunt is an established fine artist specialising in textiles. 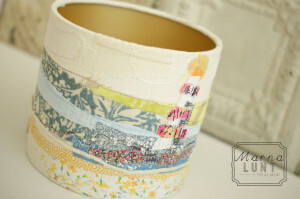 Her work is heavily influenced by the colours and textures of the North Yorkshire Moors where she spent her childhood. Marna’s work is regularly featured in magazines such as Period Living and Mollie Makes and she is a writer and embroidery expert for Craftsy. This success is down to her obsession with hand/slow stitching each tiny element within her work and her relentless search for the most beautiful fabrics, hand dyed and vintage threads and eclectic mix of finishings. Marna feels this technique gives her work personality and soul, creating something to treasure forever – a modern day heirloom. 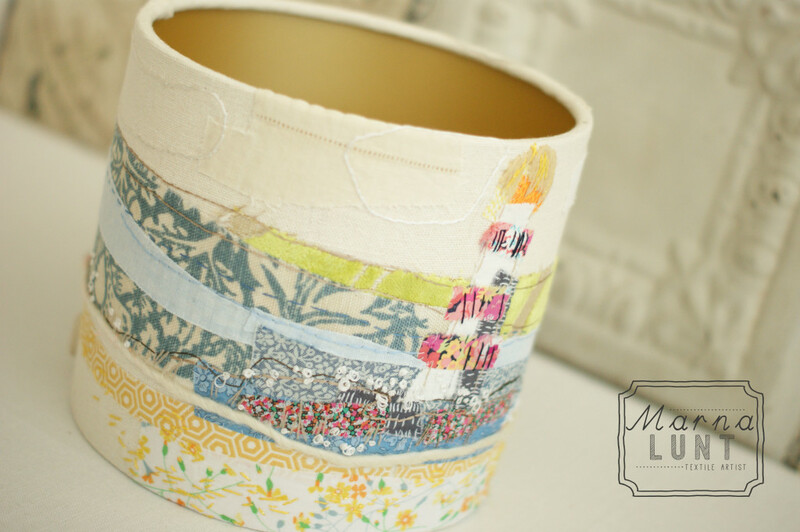 Over this two day workshop Marna will help you interpret an image of your home or a favourite place/landscape into a beautiful piece of artwork that will then be transformed into a stunning lampshade. 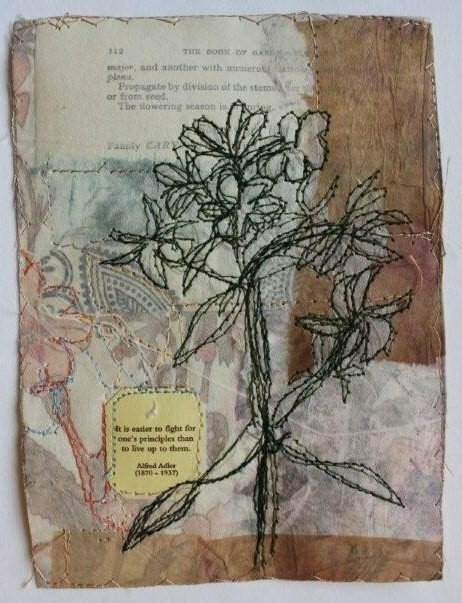 You will be taught a variety of embroidery stitches and how to draw and transfer your own design onto fabric. Marna will inspire you with her signature style whilst encouraging you to create a piece that is absolutely personal and unique.